Partygoers at the 2010 Speakeasy Costume Ball at the Woodrow Wilson House. Photo courtesy of the Woodrow Wilson House. Costume parties are fun, but costume parties in authentic mansions filled with Prohibiton-era history? Positively scandalous fun. Join the bootleggers and flappers at DC’s only presidential museum on Thursday, October 25 for a special evening benefitting the Woodrow Wilson House. Sponsored in part by DC’s first legal distillery in over a century, New Columbia Distillers, this party will definitely swing. Dance to the authentic tunes of jazz quartet Laissez Foure in your best 1920′s attire. If you’re gussied up enough you might just win the costume contest, judged by Alexandra Bookless and Alexandra Nichols of DC’s own cocktail society, LUPEC; Anastasia R. Simes, artist and costume designer for Synetic Theater; and myself. Also on hand will be DC historian Garrett Peck, author of Prohibition in DC: How Dry We Weren’t and leader of the popular Temperance Tour, and Fred Cassiday, son of legendary Congressional bootlegger George Cassiday. Cassiday was known as “the man in the green hat,” inspiring New Columbia Distillers to name their signature liquor, Green Hat Gin. We Love DC is proud to help sponsor this party dedicated to raising awareness of Wilson’s years in Washington, where he retired post-presidency to the elegant Georgian Revival mansion in Kalorama. Wilson lived at 2340 S Street NW from 1921 until his death in 1924 – the only president to be buried in DC proper, at the Washington National Cathedral. Who knows, since it’s so close to Halloween perhaps you’ll meet the man himself in his wine cellar that night after a few too many Green Hat Gin cocktails! The party runs from 7-9pm, with a special cocktail class hosted by New Columbia Distillers at 6:30pm. Tickets are $45 for the main event, and $75 to add the class. Members of the National Trust and Woodrow Wilson House friends get a $5 discount. Come kick up your heels and kick back a few cocktails with us! 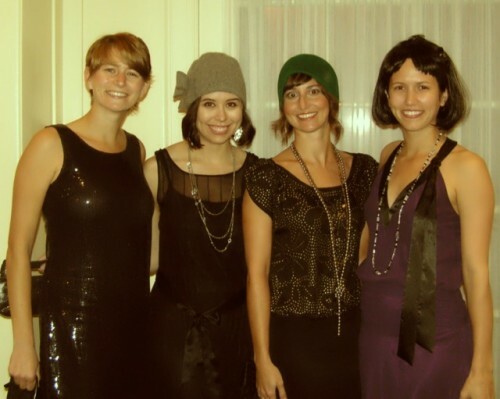 Tickets for the Speakeasy Costume Ball at the Woodrow Wilson House are available from EventBrite. Join the Facebook event page. The Woodrow Wilson House is located at 2340 S Street NW, Washington, DC. For more information call 202-387-4062 ext. 41222.